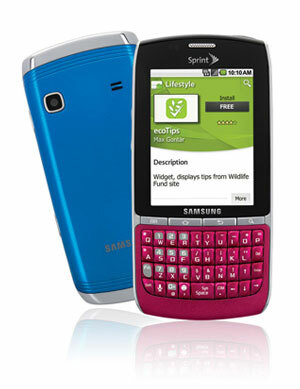 The new Samsung Replenish Android 2.2 smartphone is one of the only eco-friendly cell phones available on the market today. Offered for sale by Sprint, it is manufactured from more than 30% recycled materials and more than 80% of it is recyclable. In addition, the phone is packaged using soy ink and materials that are at least 80% post-consumer recycled waste. Phones in the environmental category have been gaining in popularity, and the new Samsung Replenish promises to take sales to the next level with its long list of features, including a QWERTY keyboard, Internet browsing capabilities and a full-color touch screen that is a large 2.8" Quarter View Graphics Array (AVGA). The phone also comes with a solar-powered battery option that allows the phone to be powered directly from the sun. This is a fabulous option if you need to charge the phone unexpectedly and are without a standard power source, although keep in mind that a one hour solar charge will only provide around 20 minutes of talk time. Also of note, the Samsung Replenish offers consumers the option of downloading a Green ID pack, which provides a number of eco-friendly apps and widgets that can help when browsing eco-friendly businesses, shopping for green products, or searching for information about local recycling. This service is also available for other phone models. Although the keyboard is rather small, it is similar to other popular smartphones and offers four rows of keys for typing, with the numbers grouped to the left in vertical rows. The camera is usable, but only comes with a 2 megapixel sensor and fixed focus lens, so it performs the best inside or in bright sunshine. As for the software, the Samsung Replenish runs Froyo, but does not come with Flash capabilities. To make the phone even more appealing to tech-savvy, eco-conscious users, Sprint has included its Sprint ID software, which was designed by developers to provide a customized set of apps, settings and widgets that are available for download. In addition, the Samsung Replenish comes standard with Sprint Zone, Sprint Music, Sprint TV, and a variety of third part apps. Further details can be found via Samsung online.